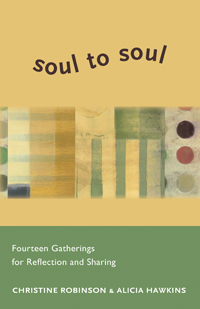 From the writers of Heart to Heart: Fourteen Gatherings for Reflection and Sharing comes this collection of fourteen additional gatherings for your small group ministry or other spiritual sharing group. Covering wide-ranging topics such as addiction, grieving and personal resilience, Soul to Soul offers new opportunities to explore life issues with others. The easy-to-use format includes an essay, inspiring quotations and thought-provoking exercises for individual reflection and for sharing with others at each gathering-plus helpful advice and suggestions for leaders. Simple yet poignant, these gatherings are sure to bring peace, growth and inspiration to any small group. One evening a woman came to her covenant group with a heavy heart. She had just been diagnosed with breast cancer, her second bout with the disease. From her experience twenty years earlier, she knew how much the treatment would take out of her, and she dreaded what was to come. She told her group that she had spent the past two days bowing out of responsibilities and activities-but that she had decided to stay in her covenant group. "I may need a ride now and then," she said, "but I need your support to get through this." Deep listening means listening from the heart rather than the mind or ego. It grows out of silence. Deep listening happens when people listen without responding, so they don't have to worry about what to say, what the other person needs to hear, or how to heal the person or solve the problem. In Soul to Soul groups, we listen and breathe, holding the other in our hearts. When someone has shared deeply, our silence tells them we've given them all our attention and that we are holding their story in our hearts. This silence connects us with one another in a way that is deeper than using words or questions. Heart to Heart opened a way to learn about the power of Soul to Soul groups. Many have seen how these groups enable their members to "grow their souls" and build deeper connections, both within church and neighborhood groups, and between individuals. This book uses the same format with different topics. The structure of a Soul to Soul group allows everyone to talk without being interrupted or questioned. I only wish I could convey adequately the delight that the people in our first four groups have expressed on hearing that there are new sessions! It has been a special privilege for me to witness the profound impact of the program as our members awaken to the potential of listening as a spiritual discipline. Each group has left the first session feeling a sense of deep kinship with their new group members and arrived at realizations that although the particulars of our stories are different, there are many universal experiences; that each of us has faced some sort of struggle and emerged knowing our own resilience; and that we are all striving to make sense of things and to be better people.